The Society exists for the advancement of meteorology and oceanography in Canada. The Canadian Meteorological and Oceanographic Society (CMOS) is the national society of individuals and organisations dedicated to advancing atmospheric and oceanic sciences and related environmental disciplines in Canada. The Society’s aim is to promote meteorology and oceanography in Canada, and it is a major non-governmental organisation serving the interests of meteorologists, climatologists, oceanographers, limnologists, hydrologists and cryospheric scientists in Canada. CMOS was officially created in 1967 as the Canadian Meteorological Society and adopted its present name in 1977, following an invitation by the Canadian Meteorological Society to the oceanographic community in Canada to join the Society. However, CMOS has a rich history dating back to 1939 when it was known as the Canadian Branch of the Royal Meteorological Society. The Society comprises over 700 members and subscribers, including students, corporations, institutions, and others who are involved in the educational functions, communications, the private sector and government. Membership is open to all who share an interest in atmospheric and oceanic sciences, their related sciences and applications. The Society addresses a broad range of national and international meteorological and oceanographic concerns including weather and weather extremes, global warming, ozone depletion and surface air quality and their effects on all aspects of life in Canada including forestry, agriculture and fisheries. Special interest groups in the Society build communities of members with common interests. An Executive and Council, elected at an Annual General Meeting govern the Society. The Society is served by a Secretariat headed by an Executive Director, appointed by Council. In addition, Council appoints members to serve on the Scientific, University and Professional Education, School and Public Education, Prizes and Awards, Consultant Accreditation and Media Weathercaster Endorsement Committees. The office of the Executive Director is the contact point for members, students, career counsellors and the general public who may be seeking information on careers and weather- or ocean-related subjects. The 14 centres located across Canada serve as focal points for formal and informal meetings on atmospheric and oceanographic subjects throughout the year. Each year a centre is chosen to host a national Congress, which attracts participants from around the world. For over 75 years, Canadian meteorologists and oceanographers have assembled to share their research and to communicate with their peers under the umbrellas of several professional societies. In 1967, the Canadian Meteorological Society ( CMS ) was formed and, beginning in 1975, CMS became CMOS when oceanographers were included. This History documents the establishment and growth of CMOS (including its predecessor societies). It shows the contribution of CMOS to the development of highly qualified researchers and operational personnel by holding annual congresses for the delivery of papers, posters and oral presentations, and by awarding prizes and scholarships. The Canadian Meteorological and Oceanographic Society has a dual history. The meteorological side of the Society traces its roots back to 1939 when a charter was obtained from the Royal Meteorological Society (RMS) to establish a Canadian Branch. The oceanographic component of the Society, on the other hand, had no previous organizational background. At a meeting of some 33 Canadian members of the Royal Meteorological Society (RMetS) in February 1940, a petition was drawn up requesting the RMetS to recognize a Canadian Branch of the Society. The formal announcement of the foundation of the Canadian Branch was made at a joint meeting of the RMetS and the American Meteorological Society ( AMS ). The Executive of the day kept no records during the war but it continued in existence. Membership grew from 60 members in 1942 to 110 at the end of the war. By 1949, the number had grown to 200 members and the Branch was well positioned for an even greater expansion in membership and activities later in the post-war years. In 1953, the Toronto Meteorological Conference was organized by the Branch and this Conference is now considered as the turning point for the organization. It was well-attended and brought together outstanding personalities from the RMetS and the AMS , and such figures as J. Bjerknes and H.U. Sverdrup from Norway . In the same year, the Montreal Centre was organized and took on the responsibilities of providing the Branch Executive. The Montreal Centre inaugurated the annual meteorological congresses and, over the next six years, congresses were held every spring usually in conjunction with the Royal Society of Canada and the other Learned Societies. The Montreal Centre also launched the forerunner of the journal Atmosphere . Initially it was called the Bulletin of Canadian Meteorology with the expectation of carrying popular scientific papers and other subjects. As interest grew in the meteorological sciences, Branch centres were soon established by 1961 in Winnipeg and Toronto . The first issue of Atmosphere appeared in March 1963. The Vancouver (British Columbia Centre), Halifax and Alberta ( Edmonton ) Centres were created in 1965, and the Ottawa Centre in 1966. The idea of separating from the RMetS and establishing an independent Society had been talked about during the 1950s. Both sides complained about the other and finally the question was discussed at the 1964 and 1965 Branch congresses. The formal decision was taken at the seventh and last congress of the Canadian Branch in 1966 at the University of Sherbrooke in the presence and with the full concurrence of the president of the RMetS, who had been invited to participate in this historic meeting by the Canadian Branch. 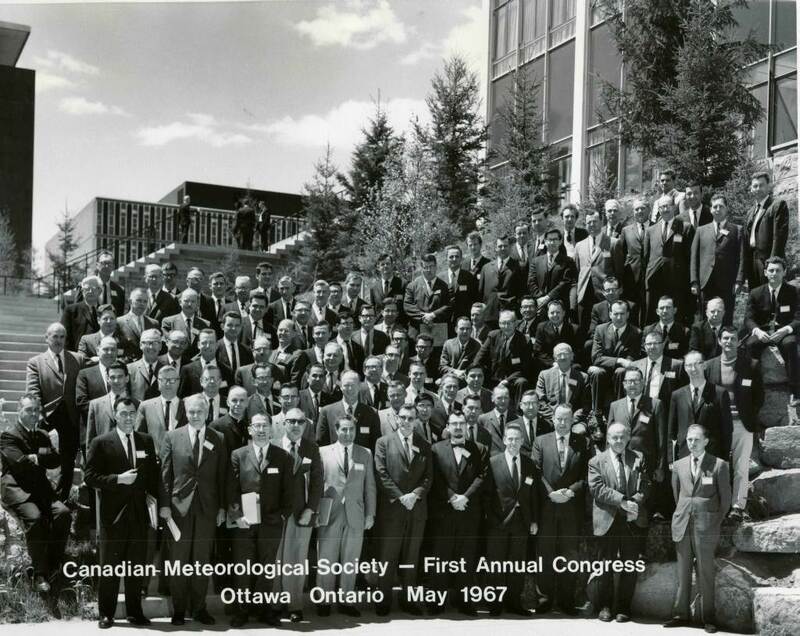 The Canadian Meteorological Society ( CMS ) came into being on January 1, 1967 and the first congress under the name of the new Society was held at Carleton University in June of that year. The President's Prize is awarded to a Society member (or members) for a recent paper or book of special merit in the fields of meteorology and has been presented since 1967. The Andrew Thomson Prize in Applied Meteorology is awarded to a Society member (or members) for an outstanding contribution to the application of meteorology in Canada . This award has been in existence since 1966 and was first presented in the spring of 1967 during the inaugural Congress of the Canadian Meteorological Society. In 1975, the Rube Hornstein Prize in Operational Meteorology was added to recognize outstanding meteorological service in a non-research capacity. In 1998, a medal was cast to honour Rube and the Prize was renamed to a medal. Oceanographers had no formal affiliation with a society in Canada . It was not until the late 1950s that a major expansion took place in ocean sciences, not only by the federal government but also by newly-created teaching and research centres of several universities. Oceanographers were keenly aware of the need to create a forum for the presentation of Canadian oceanographic papers. Initially the gap was filled by the Canadian Committee on Oceanography which organized scientific sessions with its annual meetings. However, it did not follow through with a long-term symposium structure. As Canada became involved in global meteorological and oceanographic programs and experiments such as the Global Atmospheric Research Programme (GARP), its Barbados Oceanographic and Meteorological Experiment of 1969, and the GARP Atlantic Tropical Experiment ( GATE ) of 1974, the scientists involved found themselves working on, and concerned about, similar atmospheric and oceanic modelling problems. The advantages of bringing the two scientific communities together were obvious to some. As a consequence, talks were held in 1974 with members of the CMS Scientific Committee to consider expanding the role and membership of the Society. Subsequently, the President of CMS invited oceanographers to join the Society and organize an oceanographic program for the 9th congress in 1975. The theme of the congress was The Role of the Pacific Ocean in the Climate of North America . Oceanographers became part of the Society in 1977 at which time the name of the Canadian Meteorological Society was changed to the Canadian Meteorological and Oceanographic Society and that of the journal, Atmosphere , was changed to Atmosphere-Ocean . It was also agreed that oceanographers could be eligible for the President's Prize and graduate student prizes. The Rube Hornstein Medal in Operational Meteorology and the Andrew Thomson Prize in Applied Meteorology remained exclusively meteorological. The François J. Saucier Prize in Applied Oceanography is awarded to a Society member (or members) for an outstanding contribution to the application of oceanography in Canada . First awarded in 1982, this is the longest standing Society award specific to oceanography. From 1982 until 2008, the prize was known as the CMOS Prize in Applied Oceanography. In 2009, it was renamed the François J. Saucier Prize in Applied Oceanography in memory of member Dr. Saucier who died that year. The J.P. Tully Medal in Oceanography was introduced by the Society in 1983. Any profits earned by the organization are used to promote the advancement of meteorology and oceanography. Amendments were made to the Constitution to reflect the combined interests of meteorologists and oceanographers which paved the way for the Society to become incorporated as a non-profit organization under the Canada Business Corporation Act on August 28, 1984 . In the event of the dissolution or winding up of the Society, all its remaining assets, after payment of liabilities, shall be distributed to one or more organizations in Canada having cognate or similar interests. CMOS is a registered charity and able to issue receipts for donations made to the Society. There are several ways for CMOS Members to make charitable donations to CMOS and receive a consequent tax receipt. Annual donations are the main source of revenue for scholarships, student awards, student science fair adjudications, and Society development funds. As well, one-time substantial Donations and Estate Bequests are encouraged. Member donations are also gratefully accepted. Each year since 2004, CMOS has published in its Annual Review the names of its donors in four categories: Benefactors, Patrons, Sponsors, and Donors. From the very beginning, members of the Society shared the responsibilities of serving in various executive capacities including the organization of congresses and editorship of its publications. The Society is served by a Council, an Executive, a Scientific Committee, an Accreditation Committee, a Broadcaster Endorsement Committee, a Nominating Committee, a Prizes and Awards Committee, and an Education Committee for Meteorology. Membership in 2016 is about 800 spread across Canada with members normally being associated with a Centre. In 1983, the Society appointed Uri Schwarz as its first Executive Director, a position which is still retained by the Society. Uri contributed significantly to improving the administration of CMOS business affairs. Uri was replaced by Neil Campbell in 1994 and Uri continued working in the CMOS Office as Executive Director Emeritus . After her retirement from the Meteorological Service of Canada ( MSC ) in 1993, Dorothy Neale worked as a volunteer for two decades in the CMOS Office as Executive Secretary, helping especially with her editing expertise in publications and Society documents. While he was Executive Director, Neil Campbell made many innovations and strengthened the Society awards programs. In 2004, Neil was followed by Ian Rutherford who served until 2014. Ian was also active before then, especially in computerization and in modernizing many aspects of the Society. Before 1982, the University of Toronto Press was contracted to handle both membership lists and subscriptions to publications. In 1983, a formal agreement was signed with the Canadian Association of Physicists ( CAP ) in Ottawa to provide CMOS with a complete administrative service for subscriptions, membership, mailings, etc., and the first computerized database was installed at CAP . Software difficulties at CAP in 1987 resulted in a contract (from 1988 to 1994) to handle day-to-day CMOS business with Membership List Management Services (MLMS) from Newmarket ON , managed by CMOS member, Carr McLeod. In 1994, the business affairs of the Society were returned to CAP . CMOS finally started to administer its own affairs in 2003 from office space in Department of Fisheries and Oceans buildings and began using a dedicated database and association management software which could handle membership, subscriptions, committees, and congress abstracts and registrations. In the 2000s, the names of two Society committees changed. The Education Committee for Meteorology became the School and Public Education Committee, and the Broadcaster Endorsement Committee became the Weathercaster Endorsement Committee. The following new permanent committees were formed: Advisory Committee for Atmosphere-Ocean ; Audit Committee; Centre Executive Committee; External Relations Committee; Fellows Committee; Finance and Investment Committee; Membership Committee; Private Sector Committee; and Publications Committee. From 1982 to 1986, a short-lived Schwarzwald Chapter existed in Lahr Germany . The Kelowna Chapter was formed in 1995, and renamed BC Interior Centre in 2003. In the same year, the BC Centres were reorganized into a Vancouver Island Centre, a Lower Mainland Centre and an Interior Centre (in 2014, BC Interior became BC Interior and Yukon Centre). In 2004, Chapters of CMOS were eliminated because the only difference from Centres was the minimum number of members, and there was confusion between the names. Since 2004, only four members are required to form a Centre. When oceanography was added in the Society, Atmosphere-Ocean and the Newsletter (now the CMOS Bulletin ) were well developed. Two more publications, originated by others, were added in the early 1980s. In 1983, the Society took over the Climatological Bulletin , a journal focused on climate and founded at McGill University in 1967. The Climatological Bulletin was published by CMOS for the next ten years until it was merged with the CMOS Bulletin in 1994. Chinook was a popular weather review magazine first published in 1978 by Michael Newark. CMOS became responsible for Chinook in 1984 but was unable to sustain it and Chinook was discontinued in 1989. Paul-André Bolduc, editor of the CMOS Bulletin SCMO from 1996 to mid-2016, has guided the Bulletin from a printed newsletter to a fully digital colour publication, while editing and accepting articles with high accuracy and wide interest. In 2010, the commercial publishing and marketing of Atmosphere-Ocean was transferred to Taylor and Francis , a large UK journal publisher. CMOS retains full editing and ownership of its flagship journal. Atmosphere-Ocean has improved its visibility, recognition, and has published increased numbers of papers and special issues. This was achieved with help from Richard Asselin, Director of Publications from 1996 to 2014, Sheila Bourque, Technical Editor since 1995, and from strong editorial teams. The CMOS logo was originally a snowflake with the name of the Canadian Meteorological Society and later the Canadian Meteorological and Oceanographic Society. The present logo, adopted in 1986, symbolizes its meteorological background with diagonal lines depicting rain, and blue waves representing the ocean interests of the Society. As the millennium approached, CMOS moved with the rest of the world to increase computerization and electronic communication. In 1996, a fledgling web site was started, using DFO servers. In 1998, Bob Jones took over management of the web site and brought it to a high standard of timely and comprehensive coverage, adding such elements as a photo archive of meteorological and oceanographic people and activities. Within two years, the domains cmos.ca and scmo.ca were registered and generic email addresses were established. By 2000, all the Society’s business affairs, especially publications, began moving to electronic handling. In 2003, the first ( Amsoft /Minasu) database and our own servers were acquired and overseen by Ian Rutherford after he had replaced Neil Campbell as Executive Director. During the next ten years, Ian was ably assisted by Richard Asselin who modernized our publications. Ian and Richard brought valuable management expertise to CMOS during this period. Neil Campbell remained active as Executive Director Emeritus, contributing guidance from his extensive corporate memory and strong support of the awards programs. Today everything is digital, but Atmosphere-Ocean and the Bulletin are still printed in hard copy . All papers published in A-O , Atmosphere , Climatological Bulletin, Canadian Branch of the Royal Meteorological Society and Chinook were digitized and made available to members and others. In 2014, a next generation database ( in1touch / OlaTech Corp.) was implemented, integrating congress arrangements, membership renewals and a modernized web site which allows interactive postings by Centres and members. More prizes and awards were added. In 1999, the Tertia M.C. Hughes Memorial Graduate Student Prizes in Meteorology and Oceanography were inaugurated thanks to fund-raising efforts by Andrew Weaver. The prizes were in memory of Tertia Hughes, a previous CMOS graduate student prizewinner and very promising researcher, who passed away shortly after finishing her Ph.D. In 2003, The Roger Daley Postdoctoral Publication Award was established. The Neil J. Campbell Medal for Exceptional Volunteer Service was created in 2004 and was presented by Neil for the next several years. In 2008, the Tertia Hughes prizes replaced the Society’s Graduate Student Prizes which dated from 1967. The CMOS Prize in Applied Oceanography, which was started in the early 1980s, was renamed in 2009 as the François J. Saucier Prize in Applied Oceanography in memory of François Saucier, a former winner and professor at the University of Quebec at Rimouski (UQAR). CMOS has always supported students in our disciplines. The new millennium brought new CMOS student scholarships, some in collaboration with supporters such as Weather Research House, the Natural Sciences and Engineering Research Council of Canada (NSERC) and The Weather Network. In 2011, a new scholarship, The Daniel G. Wright Undergraduate Scholarship, was created to support students intending to study Oceanography. In 2012, Denis Bourque became the first Awards Co-ordinator to handle added work related to the increased number of awards and scholarships. Denis manages nomination calls and presentations at congresses, while the long-standing Prizes and Awards Committee and the Scientific Committee continue to select annual winners. Like other established societies such as RMetS and AMS , CMOS began a Fellows program in 1999. A “Fellow" is a member who has provided exceptional service and support to the Society, and/or who has made outstanding contributions to the scientific, professional, educational, forecasting or broadcasting fields in atmospheric or ocean sciences in Canada. So far, the new millennium has seen 34 CMOS Fellows announced. Their achievements and year of naming are published on the CMOS web site. In 1999, a 25-year membership pin was inaugurated with 75 members now confirmed. CMOS (and formerly CMS for meteorology) usually hosts the presentation of two Canadian government major achievement awards in our disciplines at a special luncheon during congresses. The Patterson Medal, for distinguished service in meteorology, has been presented annually since 1961 by the Transport and Environment Departments. In 2005, the Department of Fisheries and Oceans inaugurated a similar award, the Parsons Medal , which is given for outstanding lifetime or a special achievement in ocean sciences. Honour Rolls of recipients of these medals are on the CMOS web site and winners are usually prominent CMOS members. Following the first congress in 1967, annual congresses were held in all parts of Canada , sometimes involving other societies or organizations. Venues were usually on university campuses in late spring after the students had departed. The most recent congress held at a university was in 2000 at the University of Victoria . Thereafter, Local Arrangements Committees (LACs) preferred to book delegate rooms, catering and conference services from local hotels. The 2003 Ottawa congress was the last one in which Local Arrangements and Scientific Committees did virtually everything. In following years, the recurring parts of congress arrangements, especially registration, session scheduling, abstracts, web sites and exhibits were handled by the CMOS Office using the office databases which reduced duplication and eased the load on LACs. About 110 delegates attended the first CMS Congress in 1967. Annual congress attendance more than doubled in the next two decades and reached average numbers of about 500 by the millennium. Congresses were increasingly held jointly with other societies and after 2000, attendance occasionally exceeded 700. The joint CGU / CMOS Ottawa Congress in 2010 attracted 1000 delegates. In the past two decades, these larger congresses are now the principal source of revenue for the Society, eclipsing membership fees, costs of publications and other revenue sources. In 1969, the Society began a lecture tour (later called the Tour Speaker program) under which chosen speakers would visit most Centres and Chapters, giving a talk in their areas of expertise. As this program continued, travel support was obtained from the federal departments supporting CM(O)S. The Tour Speaker program has continued with few interruptions and has been a valuable contribution to the meetings scheduled across the country. Late in 1999, CMOS accepted a request from the federal government to set up a Canadian Foundation for Climate and Atmospheric Sciences (CFCAS). In the budget for 2000-2001, the Minister of Finance announced a grant of $60M to CFCAS to fund research in climate and atmospheric sciences. Members of CMOS Council were designated members of the Foundation and approved the governance of the Foundation. In 2003, a further $50M was added to the Foundation and, during the 12 years it existed, CFCAS was able to provide $118M in research funding. Interest from invested funds covered administration of the grants and enabled the awarding of additional funds. The CFCAS, which was converted in 2011 into the Canadian Climate Forum, was guided by long-time CMOS member and past president, Gordon McBean, and it stands as one of the major achievements of CMOS in its history. The Scientific Committee issued consistent statements on climate change in 2002, 2003, 2007, 2013 (including a supplement on the oceans) and 2014. These statements were independent of the CFCAS effort but underscored the urgency of supporting climate change research. In 1999, CMOS became Secretariat for two Canadian National Committees - SCOR (Scientific Committee on Oceanic Research of the International Council for Science) and ECOR (Engineering Committee on Oceanic Resources). The Department of Fisheries and Oceans provided funding to CMOS for this. The CNC / SCOR Secretariat has since successfully functioned under CMOS and has grown to encompass much Canadian ocean science activity. Since 2003 it has produced an electronic publication, the Canadian Ocean Science Newsletter ( COSN ) that is hosted on the CMOS web site. It runs a tour speaker series to provide opportunities for interaction and collaboration between researchers on both coasts. CNC - SCOR is also active internationally with its parent body, SCOR . Unfortunately, the members of CNC /ECOR felt that Canadian ocean engineering programs might be better served elsewhere, so CNC /ECOR was dissolved in 2006. During the first decade of the new millennium, CMOS support to pre-college teachers was strengthened. Since about 2000, congresses have usually hosted “Teachers’ Days” as part of the week’s program. Teachers are chosen annually to attend Project Atmosphere (run by the American Meteorological Society) and Project Maury (run by the US Navy and AMS ). Student outreach has become an important part of CMOS . In the mid 1990s, a program was started to help students with travel costs to attend congresses. Students who receive a travel bursary are required to present a scientific paper or poster. Posters have become an integral part of the science presented at modern congresses. To recognize this, the Campbell Scientific Corporation, the largest corporate supporter of CMOS , established its Campbell Scientific Best Poster Award in 2002. In 2011, two more poster awards were established. One was ASL Environmental Sciences Best Student Poster Prize in Oceanography ( leaving the meteorological area to Campbell Scientific) and the other was from CMOS for best poster in any subject. Following a request from MSC , CMOS began an initiative to strengthen the meteorological industry. This culminated with the CMOS publication A Meteorological Industry Strategy for Canada in November 2001. A list of private sector companies that could provide meteorological (and oceanographic) services was created. During the following decade, aided by the Private Sector Committee, this list grew and referrals increased for services by these companies. In 2008, also led by the Private Sector Committee, CMOS convinced MSC to make real time meteorological and climate data open access. This was of great benefit to public and private researchers, and companies providing specialized services. A CMOS referral service continues today (2016), a legacy of this initiative. Recent history records many partnership arrangements with CMOS . Notable among these are the RMetS (original founder of CMS ) and the AMS for which reciprocal fee discounts have been negotiated for joint memberships. Similar fee discounts have also been set up the Canadian Geophysical Union (CGU). Beginning with the 2007 St. John’s congress, successful joint congresses with CGU started. CGU is now a regular congress partner every few years. Elements of AMS also participate regularly in joint congresses. In 2013, following new legislation for non-profit organizations, the Constitution underwent a major rewrite. The new rules were simplified and renamed the By-Laws and Appendices. The major change was to remove Centre Chairpersons from the governing Council. Their removal was necessary because all Councillors are required to be elected by the members and their total number is limited. The new By-Laws were approved at the 2014 AGM and published in 2015. The History of CMOS (up to 1997) is based on a series of articles written by Morley K. Thomas, published in the February, April, October and December 1994 issues of the CMOS Bulletin SCMO . The section covering the role played by the oceanographers in joining the Society was published by Dr. Cedric Mann in the February 1995 issue of the CMOS Bulletin SCMO . This document, updating events after 1997, was created by the CMOS Archivist who was assisted by a team of past-presidents, executives and long-time members. This update will be published in time for our 50 th Anniversary in 2017.